Sometimes it’s easy to know when it’s time to leave your partner. Ending things with your partner is a no-brainer when you have problems with money, cheating, or incompatibility. But what happens when your partner is addicted to drugs or alcohol? Addiction is one of the most complicated situations that anyone can face pending a breakup. After all, addiction is a disease that can be brought on by a number of factors. Some of them may be out of your partner’s control, like family history of substance use. So, how can you know for sure when to leave your addicted partner? Fear is not a healthy component of any relationship, regardless of whether or not substance abuse is involved. 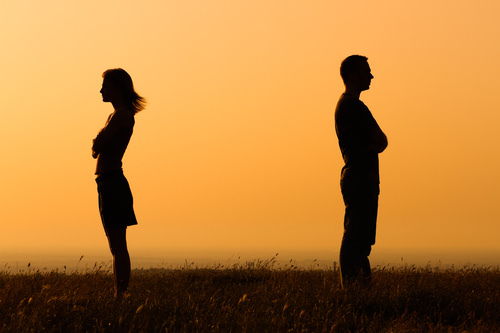 If you’re afraid of leaving your partner for any of the “rationalizations” listed above, or for any other reason, then it’s time to step back and examine the situation more in depth. Talk to friends and loved ones to gather an outside perspective of the situation. Go over your concerns and your options. Getting to the root of what makes you afraid to leave will help you determine whether or not you should. You might be tempted to stay just so you can be a caretaker for your partner. However, you should be focusing on yourself and what is best for you. For example, if your partner is violent when under the influence and you are genuinely afraid he or she will hurt you or someone one else in the event of a breakup, leaving may be the only thing to guarantee your safety. Ultimately, you are responsible for yourself and your own happiness, self-worth, and safety. Ending a relationship is always a challenge, especially when addiction and health is a major factor behind the separation. If you decide to leave your addicted partner, the key to recovering from it and moving on is detachment. Detaching from a toxic person or situation is, unfortunately, easier in theory than in execution. Still, it’s possible. When you detach, you put physical and emotional distance between yourself and your now-ex struggling with addiction. It may seem selfish, but the reality is that you’re shifting your focus off of your ex and the addiction in order to take care of n yourself. The Three C’s of addiction is a mantra that every loved one of an addict should take to heart: you did not cause it, you cannot cure it, and you cannot control it. It’s also important to remember that addiction is a disease that affects everyone. You may not be the one with the substance abuse problem, but it affects you just as much as it affects the person who drove you away with their poor choices. Knowing when to leave or if you should leave an addicted partner is never easy, but it’s not always sour, either. In the event that your ex-partner does decide to get sober, you can still show support without being in a relationship with him or her. At Discovery Institute, we offer a wide variety of programs and services to ensure that all of our patients get the treatment they need to live a long, sober life. If you are worried about your former partner even after the breakup and would like to learn more, please call us at 888-616-7177.